Guru Gautam Steel is one of the leading manufacturer, Supplier, Exporter and stockist of Carbon Steel Forged Fittings in India. 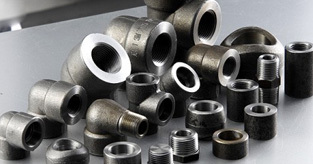 GGS offer CS Forged Fittings in two types Threaded and Socket-weld type, for threaded fittings there are different types of thread like NPT, BSP and BSPT etc. We keep stock for A105 Forged Pipe Fittings for urgent need for our clients and we also keep stock for A694 F42 and F52 and also LTCS grade LF2 in stock other Carbon steel grade we do manufacturing and supply to our clients in given delivery period. We also provide value added service to our clients like Hot dipped Galvanizing etc. Our low temperature forged fittings are supplied as per NACE MR 0175 and we also take orders under third party inspection agencies like TUV, DNV, Lloyds, Eil, BV, Mecon etc.